Left Coast / Right Coast: Snow! 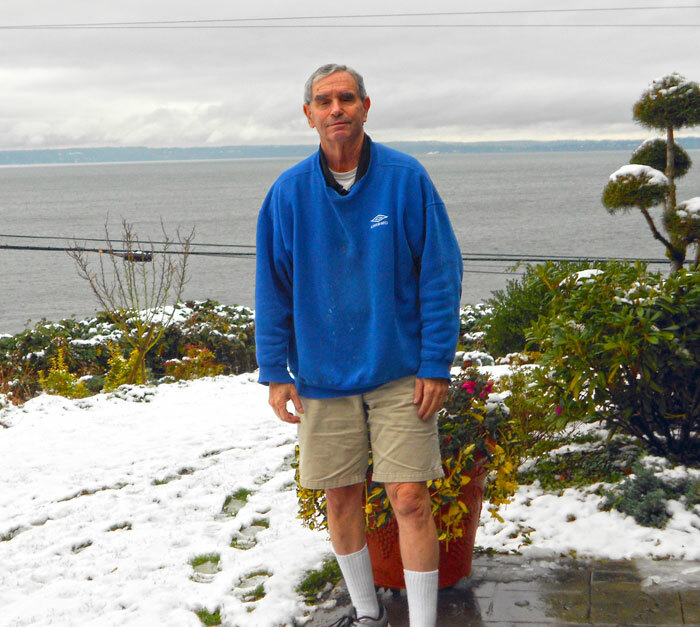 We’ve had over five inches of snow (down on the Sound in Edmonds, where we now live) and very cold temperatures for the past few days. Mill Creek got over seven inches. Everett got just over a foot of it. For the past two mornings, the temperature in some places has been below 20 degrees F. About as cold as it has been in more than two decades. And more snow is on the way. Now one thing you can count on is that virtually no one can drive in snow around here. Proof? There were almost 200 accidents and spin-outs in Snohomish County the first day after the over-night snow. Mill Creek Road from Bothell Everett Highway was closed east of where 164th Street SE turns into Seattle Hill Road. That is a very steep and curvy road. And since our area generally has very few snowplows, they tend to try and maintain the main roads. There simply is not enough equipment to get at all the secondary roads, let alone the individual neighborhoods. Now most cars today have anti-lock brakes. The technology is simple to understand. When sensors in the wheels detect wheel lock up – such as when you press on the brake pedal too hard on slick roads, the system automatically pumps the brakes – thereby providing a modicum of control. However, if you understand simple physics, Newton’s First Law says that a body in motion stays in motion until an external force is applied to it. On a snow-covered road, the huge mass of the car cannot simply be brought down to zero that easily. Even with anti-lock brakes, it still takes significantly more distance to bring the car to a stop. So during the past two days, there were hundreds of “rear-end” collisions, in which the car behind the other car could not stop in time. Worst of all, modern cars are designed to progressively collapse, thereby absorbing a lot of the energy of the crash protecting the occupants. So while you are relatively safe with your seat belt and air bag, the cost of repairing the car gets very very expensive very quickly. Many are surprised that a relatively slow collision can quickly mount in repair cost to over $20,000. Often the insurance company will “total” the car, as the repair cost is more than the value of the car. Along with expensive auto repairs (fortunately a small percentage of all cars on the road get into a crash), you also have to deal with clearing your driveway and sidewalk of snow. In New England, where we lived for over 30 years, most communities have laws requiring you to clear your sidewalk of snow (if you have a sidewalk). That is clearly a safety issue. If you don’t shovel off your driveway, as you drive over it, you turn the snow into glare ice. Many folks cannot get their car up their own driveway and into their garage. In our vacation home in New Hampshire, they have so much snow that many people contract with a local company to plow their driveway. Funny, when we first lived there, I saw many trees in the front of homes with a sign that said: “Plow.” For a short while, I thought that the Plow family was extremely large – occupying over 20% of the homes. The sign was the signal to the plowing company that that driveway was under contract. In our home in Massachusetts we would often get well over a foot of snow every winter. However, the towns have sufficient snow removal equipment that virtually within half a day, just about every street was plowed.